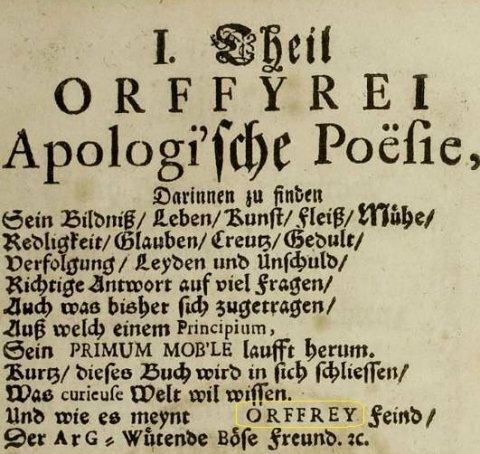 Just as the second revision of the Merseburg drawing had a clear numbering error, the first page of "Apologishe Poesie" contains a major spelling misstake. ORFFYRE is spelled as ORFFREY. It is almost impossible that the inventor spelled his name wrong in the first page of his defence book. We also notice an unnatural and odd gap with no apparent reason just before the misspelled name "ORFFREY". If we investigate this a little further, we see that ORFFYRE has the same letters as ORFFREY (it is only the Y that has been moved to the right), so he say that it is the letters or the value of the letters (gematria) themself that is important. Then we can also conclude that since the name is placed all too long to the right, it has to mean that it was important to get the letter "Y" just where it is placed. It has to have a visual thus geometric mission also! If this was an important thing to him, this would be a secret way to prove it. Is this the reason why Orffyres writes that this book is published and the machine will be "patented" in the year that is written with the number 17, twice! When Orffyres wrote "17 twice", he is saying 17 and 17, not 1717. If we add the numbers we get 1+7 and 1 + 7 = 8 and 8. 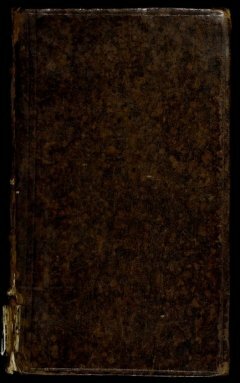 So both ORFFYRE, ORFFREY and the year 1717 equals "88"
So what is the meaning of "88"? Why did he change his name, so it would have the value 88? If we study his book "Apologia Poetica" from 1717, we will notice that some letters looks just like numbers. Since letters also is numbers, then the alphabetic equivalent to 8 is H. So we may ask what is it about "88" or maybe "HH" that was important to Orffyreus? Some will now recognize the appearance of "HH" as something else, and even recognize it as a "sacred" number? But what is the real purpose of this number? Is it maybe a symbol of the Rosicrucian and egyptian secret? Or is it simply a special number used by Orffyreus? Is it a code, a symbol or does it have something to do with the construction of his machine? But why did Orffyreus do this? My book explains and proves all this in great detail.